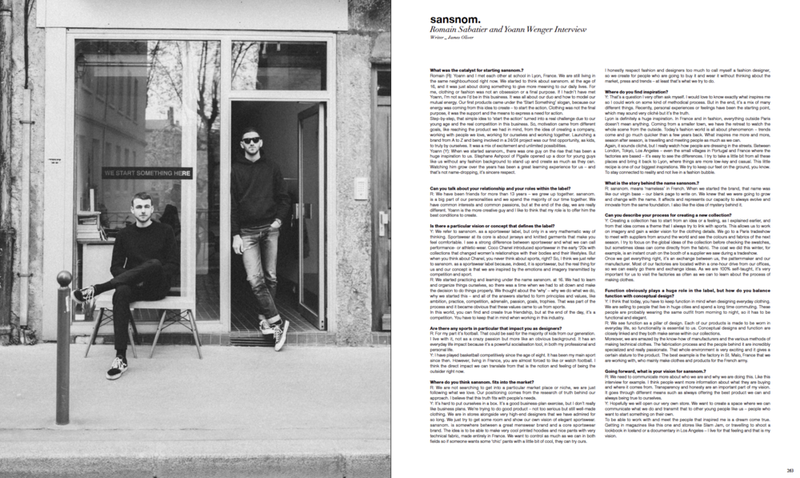 Fall Winter 17 Edito & Interview for The New Order Magazine Vol.17 — sansnom. What was the catalyst for starting sansnom.? Romain (R): Yoann and I met each other at school in Lyon, France. We are still living in the same neighbourhood right now. We started to think about sansnom. at the age of 16, and it was just about doing something to give more meaning to our daily lives. It was all about our duo and how to model our mutual energy. Our first product came under the "Start Something" slogan, because our energy was coming from this idea to create - to start the action. Clothing was the support and the means to express a need for action. Step-by-step, that simple idea to "start the action" turned into a real challenge due to our young age and the real competition in this business. So, motivation came from different goals, like reaching the product we had in mind, from the idea of creating a company, working with people we love, working for ourselves and working together. Launching a brand from A to Z and being involved in a 24/24 project was our first opportunity, as kids, to truly be ourselves. It was a mix of excitement and unlimited possibilities. Yoann (Y) : When we started sansnom., there was one guy on the rise that has been a huge inspiration to us. Stephane Ashpool of Pigalle opened up a door for young guys like us, without any fashion background to stand up and create as much as they can. Watching him grow over the years has been a great learning experience for us - and that's not name-dropping, it's sincere respect. Can you talk about your relationship and your roles within the label? R: We have been friends for more than 13years - we grew up together. sansnom. is a big part of our personalities and we spend the majority of our time together. We have common interests and common passions, but at the end of the day we are really different. Yoann is the more creative guy and I like to think that my role is to offer him the best conditions to create. Is there any particular vision or concept that defines the label? Y: We refer to sansnom. as a sportswear label, but only in a very mathematic way of thinking. Sportswear at its core is about jerseys and knitted garments that make you feel comfortable. I see a strong difference between sportswear and what we can call performance - or athletic wear. Coco Chanel introduced sportswear in the early 20s with collection that changed women's relationship with their bodies and their lifestyles. But when you think about Chanel, you never think about sports, right? So I think we just refer to sansnom. 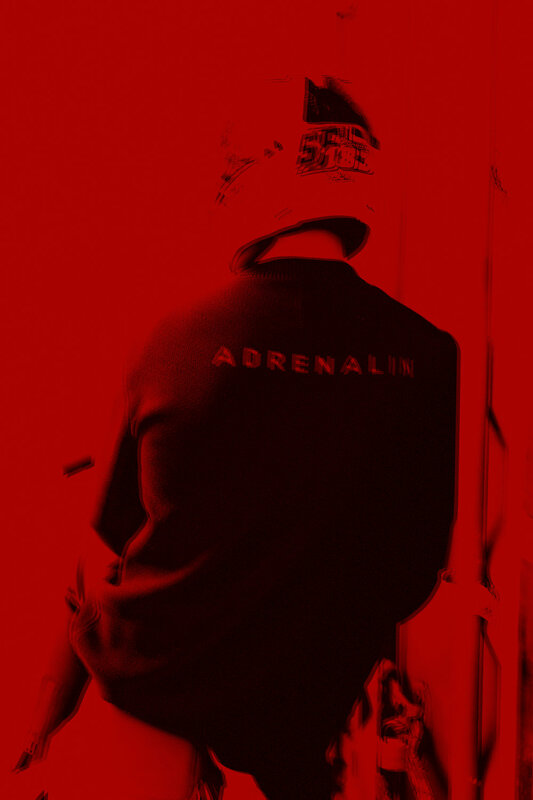 as a sportswear label because, indeed, it is sportswear, but the real thing for us and our concept it that we are inspired by the emotions and imagery transmitted by competition and sport. R: We started practicing and learning under the name sansnom. at 16. We had to learn and organise things ourselves, so there was a time when we had to sit down and make the decision to do things properly. We thought about the "why" - why we do what we do, why we started this - and all the answers started to form principles and values, like ambition, practice, competition, adrenalin, passion, goals, trophies. That was part of the process and it became obvious that these values came to us from sport. Are there any sports in particular that impact you as designers? R: For my part it's football. That could be said for almost all the kids from our generation but I live with it, not as a crazy passion, but more like an obvious background. It has an everyday life impact because it's a powerful socialisation tool, in both professional and personal life. Y: I have played basketball competitively since the age of eight. It has been my main sport since then. However, living in France, you are almost forced to like or watch football. I think the direct impact we can translate from that is the notion and feeling of being the outsider right now. Where do you think sansnom. fits into the market? R: We are not trying to get into a particular market or niche, we are just following what we love. Our positioning comes from the research of truth behind our approach. I believe this truth fits with people needs. Y: It's hard to put ourselves in a box. It's a good business-plan exercice, but I don't really like business plan. We're trying to do good product - not too serious but still well-made clothing. We are in stores alongside very high-end designers that we have admired for so long. We just try to get some room and show our own vision of elegant sportswear. sansnom. is somewhere between a great menswear brand and a core sportswear brand. The idea is to be able to make very cool printed hoodies and nice pants with very technical fabric, made entirely in France. We want to control as much as we can in both fields so if someone wants some "chic" pant with a little bit of cool, they can try ours. I honestly respect fashion and designers too much to call myself a fashion designer, so we create for people who are going to buy it and wear it without thinking about the market, press and trends - at least that's what we try to do. Y: That's a question I very often ask myself. I would love to know exactly what inspires me so I could work on some kind of methodical process. But in the end, it's a mix of many different things. Recently, personal experiences or feeling have been the starting point, which may sound very cliché but it's the truth. Lyon is definitely a huge inspiration. In France and in fashion, everything outside Paris doesn't mean anything. Coming from a smaller town, we have the retreat to watch the whole scene from the outside. Today's fashion world is all about phenomenon - trends come and go much quicker than a few years back. What inspires me more and more, season after season, is travelling and meeting people as much as we can. Again it sounds cliché, but I really watch how people are dressing in the streets. Between London, Tokyo, Los Angeles - even the small villages in Portugal and France where the factories are based - it's easy to see the differences. I try to take a little bit from all these places and bring it back to Lyon, where things are more low-key and casual. This little recipe is one of our biggest inspirations. We try to keep our feet on the ground, you know. To stay connected to reality and not live in the fashion bubble. What is the story behind the name "sansnom."? R: sansnom. means nameless in French. When we started the brand, that name was like our virgin base - our blank page to write on. We knew we were going to grow and change with the name. It affects and represents our capacity to always evolve and innovate from the same foundation. I also like the idea of mystery behind it. Can you describe your process for creating a new collection? Y : Creating a collection has to start from an idea or a feeling, as I explained earlier, and from that idea comes a theme that always try to link with sports. This allows us to work on imagery and gain a wider vision for the clothing details. We go to a Paris tradeshow to meet with suppliers from around the world and see the colours and fabrics of the next season. I try to focus on the global ideas of the collection before checking the swatches, but sometimes ideas can come directly from the fabric. The coat we did this winter for example, is an instant crush on the booth of a supplier we saw during a tradeshow. Once we get everything right, it's an exchange between us, the patternmaker and our manufacturers. Most of our factories are located within a one-hour drive from our office, so we can easily go there and exchange ideas. As we are 100 self-taught, it's very important for us to visit the factories as foten as we can to learn about the process of making clothes. Function obviously plays a huge role in the label, but how do you balance function with conceptual design? Y: I think that today, you have to keep function in mind when designing everyday clothing. We are selling to people that live in huge cities and spend a long time commuting. These people are probably wearing the same outfit from morning to night, so it has to be functional and elegant. R: We see function as a pillar of design. Each of our products is made to be worn in everyday life, so functionality is essential to us. Conceptual designs and function are closely linked and they both make sense within our collections. Moreover we are amazed by the know-how of manufacturers and the various methods of making technical clothes. The fabrication process and the people behind it are incredibly specialized and passionate. That whole environment is very exciting and it gives a certain stature to the product. The best example is the factory in St Malo, France that we are working with, who mainly make clothes and products for the french army. Going forward, what is your vision for sansnom. ? R: We need to communicate more about who we are and why we are doing this. Like this interview for example. I think people wants more information about what they are buying and where it comes from. Transparency and honesty are an important part of my vision. It goes through different means such as always offering the best product we can and always being true to ourselves. Y: Hopefully we will open our very own store. We want to create a space where we can communicate what we do and transmit that to other young people like us - people who want to start something on their own. To be able to work with and meet the people that inspired me is a dream come true. Getting in magazines like this one and stores like Slam Jam, or travelling to shoot a lookbook in Iceland or a documentary in Los Angeles - I live for that feeling and that is my vision.